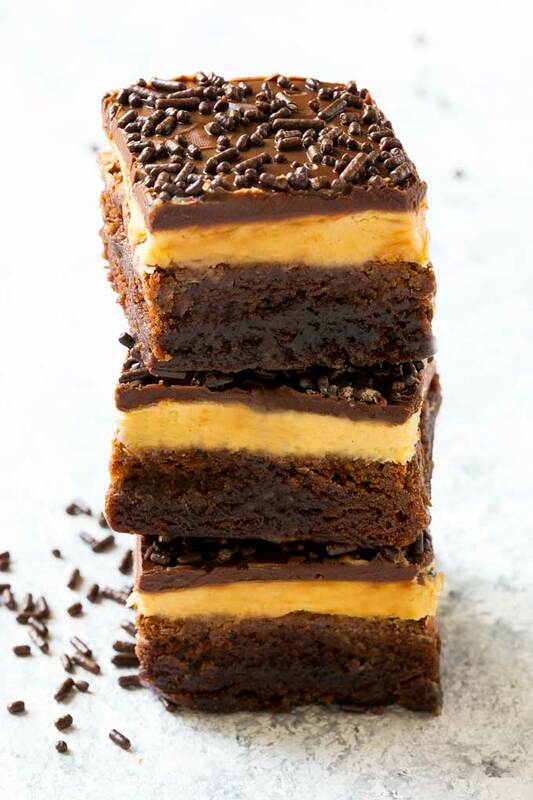 These peanut butter brownies are a rich chocolate base topped with peanut butter frosting and a layer of fudge. A dessert that looks fancy but is actually super easy to make! If you’re into peanut butter cups, you will adore these decadent brownies! 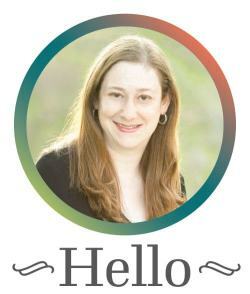 I’m just gonna come out and say it. 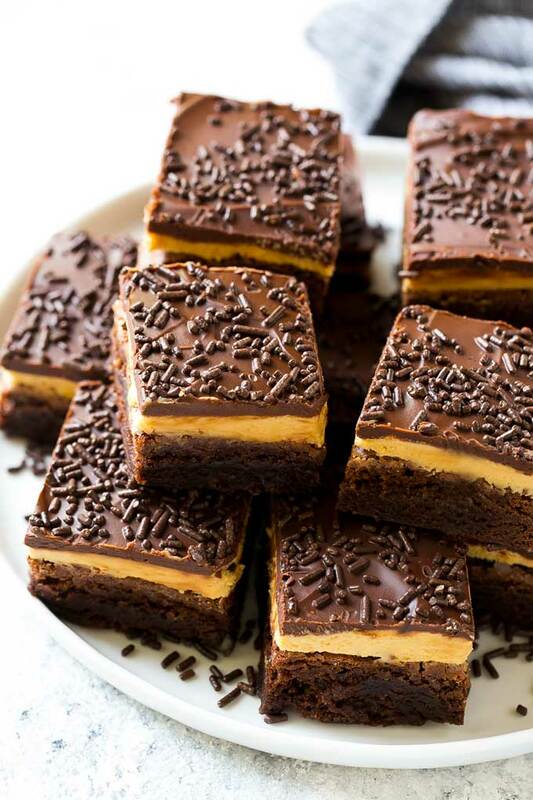 These peanut butter brownies start with a mix. 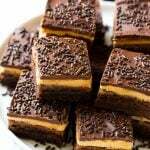 But then they’re topped with a rich and creamy layer of peanut butter frosting, fudge AND chocolate sprinkles. 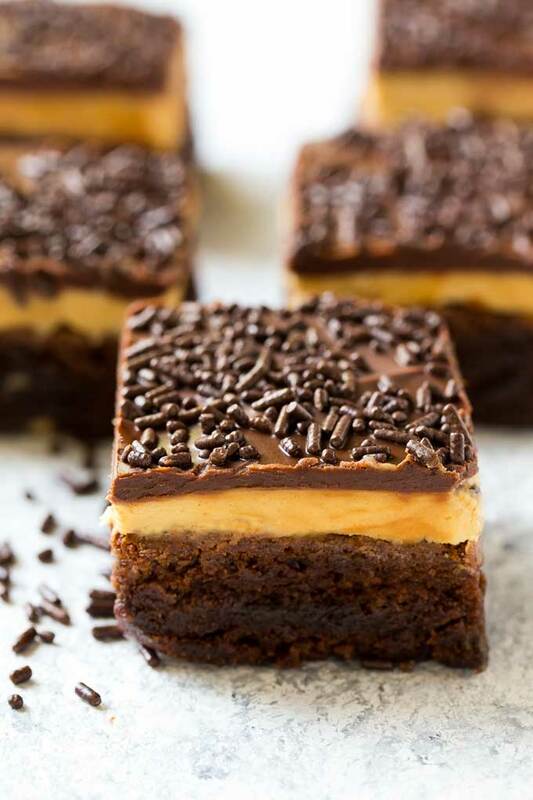 They’re pretty much the ultimate brownie for chocolate and peanut butter lovers. So excuse the use of a mix and read on, because you are going to want to make this recipe. This first step to making your peanut butter brownies is to prepare the brownie mix as directed on the package. You can bake your brownies in either a 9″x 9″ or 9″x”13 pan, depending on how thick you want your brownies to be. The brownies pictured were baked in a 9″x9″ pan, and after all the layers went on they were almost as tall as the pan! After the brownies cool, they get topped with an easy peanut butter frosting, and melted chocolate chips mixed with butter makes up the top layer. The sprinkles can be omitted if you like, but I think they make the brownies look nicer. The hardest part about this recipe is actually cutting the brownies into neat squares. You’ll want to use a very sharp knife, and wipe off the knife with a paper towel after each cut to keep the layers looking clean. These brownies are best stored in the fridge, simply cover them and store them for up to 5 days. If they last that long that is. They’re freezable too, simply wrap with plastic wrap, place into a resealable freezer bag, and store for up to one month. These are some of the best brownies I’ve ever had, the combination of flavors and textures makes them a real treat for all! Line a 9"x9" or 9"x13" pan with foil, leaving an overhang on the sides. Coat with cooking spray. Prepare the brownie mix with the eggs, oil and water as called for on the package. Stir in the vanilla extract. In a medium bowl with a mixer, beat 8 tablespoons of the butter until fluffy. Add the peanut butter powdered sugar and milk. Beat until thoroughly combined. Spread the peanut butter mixture evenly over the brownies. Place the chocolate chips and remaining 4 tablespoons of butter in a bowl. Microwave in 30 second increments until melted. Stir until smooth. Let the chocolate sit for 5 minutes at room temperature or until it's lukewarm. Spread the chocolate evenly over the peanut butter layer. Quickly add the sprinkles on top. Chill for at least 30 minutes. Use the foil overhang to lift the brownies out of the pan. Cut into squares and serve. This recipe can be made in a 9"x9" or 9"x13" pan, the recipe as written yields a very thick brownie. If you prefer a thinner brownie, use the 9"x13" pan. Absolutely fabulous! I made these for a part and they went sooo quickly! I also added 1 Tbsp expresso to the brownie mix to help bring out the chocolate flavor. So glad to hear everyone enjoyed them! Thanks for reporting back!